Continuum of care, retailization, flexibility: Buzzwords bringing change and redefining the hospital campus of today. It is a redefinition that is shifting the way hospitals do business now and in the future. “Hospitals are working to drive less patients to their facilities,” commented Michelle Brokaw, owner and CEO of Fleisher Smyth Brokaw LLC. It is a push driven by the evolution of the care and how it’s being delivered. “Our goal is to empower people with knowledge and resources so they now take a more active role than ever before in making informed decisions about their own health. Empowering our community through education, disease prevention and providing resources for their health is why we are named a health campus versus a hospital,” said Carole Peet, CEO of St. Anthony North Health Campus, which opened in Westminster in March 2015. 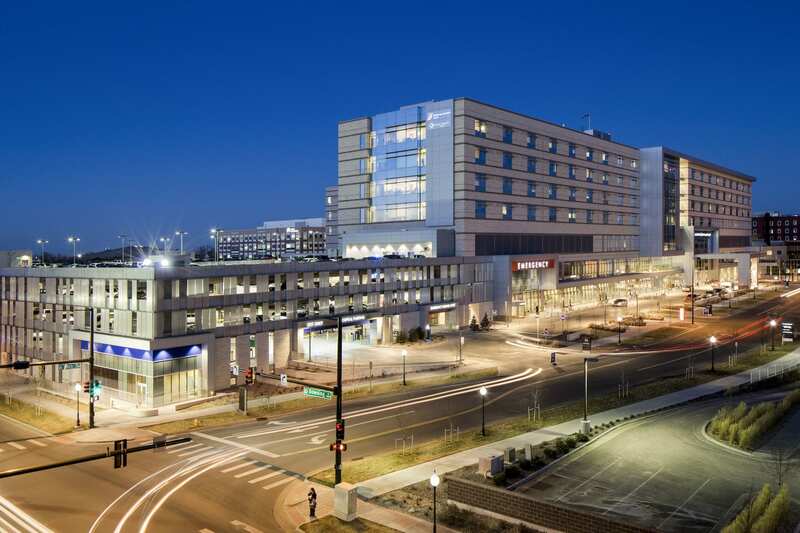 “Since the initial discussions several years ago to expand health care services to our north Denver community, the challenge from our community was not to build a replacement hospital but how to think innovatively to build an organization that would achieve competency in all areas of care delivered across the continuum of care, from preventative and population health management to palliative and comfort care,” she continued. “Hospitals aren’t Blockbuster and won’t suddenly vanish, but we will not serve the spectrum of patients like we did in the past,” added Jamie Smith, president of St. Joseph Hospital, which was built on the site of its historic Uptown location and saw its first full year of operation in 2015. “I do see a lot of changes for hospitals in the future. The baby boomer generation needs heath care services but they are not the World War II and generation before them. They have different ideas of how to receive care and live the last part of their lives. The hospital becomes a more acute place, where you only need to be in an extreme situation. “Campuses start to evolve to be continuum driven, where there are more outpatient surgery services. New campuses of the day are not inpatient oriented,” said Smith. And with the retailization of health care – patients shopping around for the cost, convenience, quality, location and availability they want – health care services are no longer limited to hospital campuses. Health care is now locating where the patients are, bringing to communities urgent care, freestanding emergency departments and urgency centers, for example. “Future hospital campuses are going to become centers for higher and higher acuity,” said Steve Carr, AIA, principal and health care practice lead, H+L Architecture. “In regard to health systems, the off-campus medical office buildings are utilized to attract new patients and capture more market share. The health systems want to create a relationship with the patient so when more in-depth care is needed, they proceed to their hospital,” added John Gustafson, director, Newmark Knight Grubb Frank. Hospital campuses today also are moving away from the clinical, sterile facilities of the past and to a more hospitality, customer-service model. “Today’s hospital campus is redefining the ‘patient paradigm.’ They seek to serve an entire population’s continuum of care with an ever-increasing focus on preventive and ‘chronic wellness’ care,” said Justin D. Cooper, LEED AP, vice president-project development, Saunders Construction Inc. Both St. Joseph Hospital and St. Anthony North Health Campus incorporated unique elements in the construction and design of their campuses. “For instance, with our facility, there is lots of attention paid to the patient experience,” explained Smith, noting St. Joseph is incorporating hospitality-like elements such as valet parking, and features more natural light, common areas, 15-foot ceilings, water features and true retail amenities, including a Dazbog Coffee and Fit Kitchen. Additionally, flexibility is paramount in the design and construction of today’s hospital campuses due to the ever-changing nature health care, reimbursements and the facility’s ability to adapt and evolve with that change. “The traditional paradigm of the hospital campus will continue to evolve into a much more diverse and integrated wellness, health education, community gathering and specialized chronic care services campus. These campuses often must plan to integrate two ‘traditional hospital’ partners, often where a specialty hospital provider partners with a community or academic/research hospital campus; each with their own specific operational and branding requirements. Design and construction providers must therefore bring a diverse team of expertise in luxury hospitality, recreation, fitness, mission critical/data centers, demonstrative kitchens and high-end retail to today’s hospital campus,” said Cooper. While there isn’t a crystal ball forecasting the future of hospital campuses, there is consensus that their need remains.